Probably one of the most well-loved, talked about party games of the recent years, I’ve lost count of the times that friends and acquaintances gleefully bring out the long, black…box, and describe it to the unacquainted as “the game to see who’s the most f***ed up among us”. The game is straightforward, a player picks a black Question card, and the others fight to stand out with their white Answer cards – the funniest (usually) wins. It’s deceptively simple, because while you could go down the logical route and pick an answer that “makes sense”, or tumble down the creative (see: politically incorrect) one, you’re also going to need some sense of what the player asking the question would prefer. There have been times when question-askers actually preferred logical answers, and the cheeky ones who threw out their best, most appalling picks lost their trump card instantaneously. Regardless, while there have been variations of the original game, like Limpeh Says, a Singapore-made nod to the franchise, there’s probably none that’s as relatable to us at Vulcan Post than Kickstarter newbie Pitch Deck. 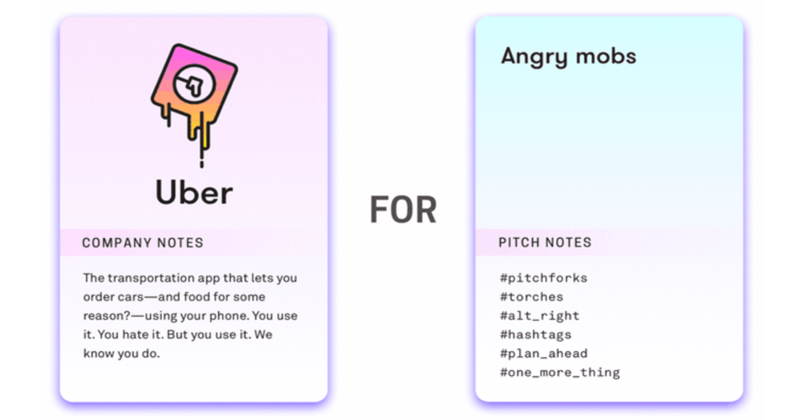 The rules are pretty much similar to Cards Against Humanity – you need to make a killer combination with your Pitch card (the Answer card in CaH) to the Company card (the Question card in CaH) set on the table – but that’s just half of your job. Instead of simply letting your card speak for itself, you need to make a quick elevator pitch, describing what the company does – very much like a mini pitching event of sorts. Every round will also have an investor, who will then decide on the company that everyone will secretly fund in a particular round. Total funding amounts are only revealed at the end of the game, and the winners would be 1) the person who pitched the most valuable company; and 2) the person who invested the most in that company. But of course, they’re quick to claim that it “no way depicts actual people”. 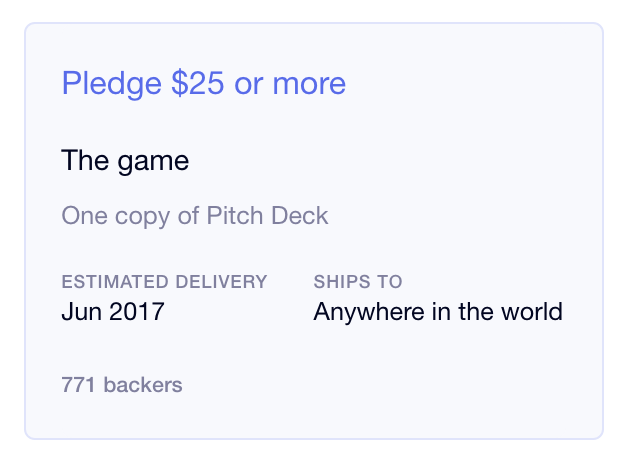 Created by Fred Benenson and Alex Hague, the brains behind the deck have collectively run “7 Kickstarter projects and have successfully delivered thousands of rewards ON TIME to backers around the world” – an assurance to the disillusioned Kickstarter crowd who have experienced late, or unfulfilled funding rounds. The duo also assures that Hague has “years [of] experience on the manufacturing and fulfilment side of game production”, albeit reminding funders about the possibility of the “regular types of delays that occur across all types of Kickstarter projects”. 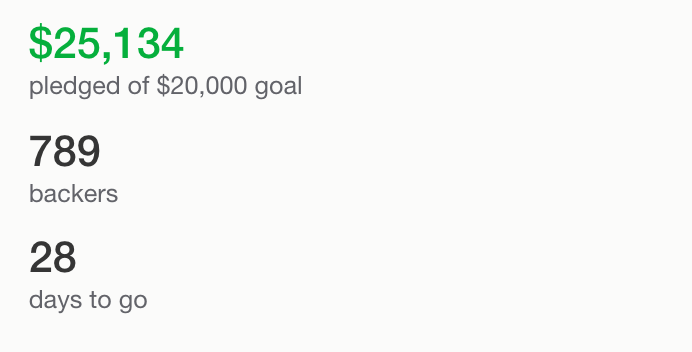 Launched just yesterday (18 Jan), the project has already hit its target of US$20,000 – and it’s really not difficult to see why it has gained so much support. Interested? 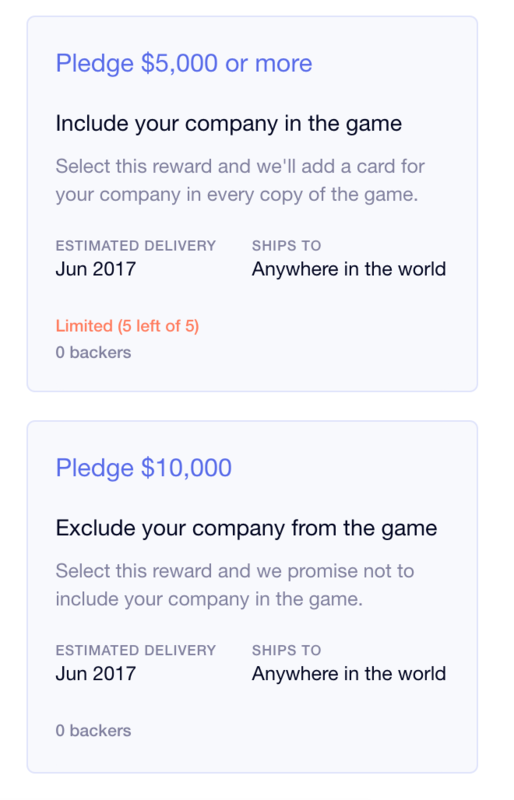 You can get the game (which includes 90 Company cards and 350 Pitch cards) for US$25 – this doesn’t include shipping fees, though. The game, albeit being a parody of startups and pitches, might actually one day come in handy for those looking for the next big idea. I mean, aren’t the ideas that many startups introduce once seen as “impossible and plain ridiculous” at one point of time? But as a publication that covers startups, many of whom have actually described themselves as the “(famous company) for (cause)”, I can only imagine the hours of fun our team can have with the game. Fund Pitch Deck on Kickstarter here. For those who can’t wait, and have a lot of time on your hands, the team has actually make the game available as a free Creative Commons licensed download. But really, support the cause if you can.